"Doubt is our product since it is the best means of competing with the 'body of fact' that exists in the minds of the general public. It is also the means of establishing a controversy"
-Cigarette company executive, "Manufacturing Doubt" in the 1960 to counter the facts about the cancer link to cigarettes. Global warming is again in the headlines. While the deniers and skeptics are trying to debunk what is actually happening countries around the world are meeting in Copenhagen beginning today to tackle the issue of climate change. There are skeptics and deniers who have bought into the claim that climate change is all a plot to weaken our economic position in the world and destroy our economy, so that the third world can get a leg up. It is a stupid argument. The economic downturn currently effecting western nations and the United States has hurt the third world twice as much as anyone else. They depend on the west for financial aid, in addition to western manufacturing plants that have moved to the third world that would be hard hit if the the western economies declined more than they have at this point. To also claim that global warming is due to the sun and that the methane problem is due to flatulent cows alone is another bogus argument. There are definitely many more cows in the world than a hundred years ago, due to the world's demand for meat and they do have a gas problem, but to ignore the coal fired plants and industrial pollutants and auto emissions is laughable if not intellectually incompetent. Any scientist will tell you that there can be no certainty when it comes to the science of climate change but there is a high degree of probability based on the research. The fact that some emails were found where scientists were discussing inconsistencies and how to present them still doesn't change the facts. As Abraham Lincoln said "How many legs does a dog have if you call the tail a leg? Four; calling a tail a leg doesn't make it a leg." For every gallon of gasoline a car uses it puts nineteen and a half pounds of Co2 into the atmosphere; multiply that by the millions of automobiles on the roads around the world every day for just one year and then say that that has no effect. Anyone who claim that the human contribution of Co2 to the atmosphere has no effect on climate is denying the obvious and there is no intelligent discussion possible. There is something called "manufactured doubt", it was a concept developed by the PR firm, Hill and Knowlton who were hired by the cigarette industry back in the sixties to conceive of an idea to convince the public that cigarettes didn't cause cancer and counter the scientific research that showed that smoking led to cancer. They created their own pseudo research organizations that pumped out reports debunking the medical research, creating doubt and uncertanty. A cigarette company executive has said, "Doubt is our product since it is the best means of competing with the 'body of fact' that exists in the minds of the general public. It is also the means of establishing a controversy". The new mission is manufacturing doubt about climate change. Manufactured Doubt is now an industry that has matured to become an effective tool used by industries such as the coal industry, the oil industry and even the health insurance industry, evidence the campaign to convince the public to act against their own self interest when it comes to health insurance. It is basically profits before everything else. The livability of the planet is not important. The greatest harm will be to the third world as they are the least prepared to cope. The deaths, and displacement of millions and maybe billions of souls is of no importance before the almighty god 'Corporate Profits'. Social responsibility be damned. Only when it becomes personal will the deniers, contrarians and skeptics scream uncle. The science is out there and it is scary. The scientists on the front line that do the work are frightened and have sent the message but the question is, are enough people listening, and is there still time to stave of the worst that could befall us? Is Copenhagen humanities last chance, or is it already too late? My forlorn hope is that sanity prevails and a sense of urgency take hold and something positive begins in Copenhagen for if it doesn't, the alternative is unthinkable. 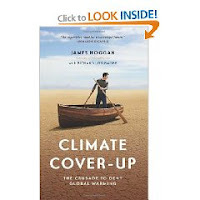 For the skeptics, deniers, and those people with their heads up the butts, read Bill McKibben's report. If this doesn't move you your brain is on permanent hiatus. "Physics has set an immutable bottom line on life as we know it on this planet. For two years now, we’ve been aware of just what that bottom line is: the NASA team headed by James Hansen gave it to us first. Any value for carbon dioxide (CO2) in the atmosphere greater than 350 parts per million is not compatible "with the planet on which civilization developed and to which life on earth is adapted.” That bottom line won’t change: above 350 and, sooner or later, the ice caps melt, sea levels rise, hydrological cycles are thrown off kilter, and so on. Oh, and the current level of CO2 in the atmosphere is already at 390 parts per million, even as the amount of methane in the atmosphere has been spiking in the last two years. In other words, we’re over the edge already. We’re no longer capable of “preventing” global warming, only (maybe) preventing it on such a large scale that it takes down all our civilizations." Fox News repeatedly claims apparently stolen CRU emails were "leaked," "revealed," "uncovered"
Gretchen Carlson’s Hypocrisy Or Personality Disorder?